Can Sitting Cause Cancer and other Diseases? Did you know that sitting for 6 or more hours daily can elevate your chances of dying from cancer and other major diseases – even if you maintain a healthy weight and don’t smoke? Women who sat for six or more hours daily faced a 37% greater risk of death as compared to those who sat for three hours or less. Those who did not exercise regularly and also sat for long periods faced even greater mortality rates – a startling 94% higher for women and 48% higher for men. Kansas State University professor Richard Rosenkranz and colleagues also examined the link between time spent sitting and chronic diseases. They discovered the more you sit, the higher your risk of chronic diseases including cancer. The study’s sample included 63,048 males ages 45-65 from Australia. Researchers from the University of Western Sydney in Australia collaborated. Compared with those who reported sitting four hours or less per day, those who sat for more than four hours per day were significantly more likely to report having a chronic disease such as cancer, diabetes, heart disease and high blood pressure. The reporting of chronic diseases rose as participants indicated they sat more. Those sitting for at least six hours were significantly more likely to report also having diabetes. The findings are particularly relevant to office workers sitting at desks for long periods of time. “We know that with very high confidence that more physically active people do better with regard to chronic disease compared with less physically active people, but we should also be looking at reducing sitting,” Rosenkranz said. They discovered that people who sat more reported more chronic diseases — even if they had a similar body mass index compared with those who sat less. The study focused on males, because they have higher rates of diabetes and heart disease, but it is probably applicable in adults across gender, race and ethnicity, Rosenkranz said. Oregon State University research suggests the health benefits of small amounts of activity – even as small as one- and two-minute increments that add up to 30 minutes per day – can be just as beneficial as a trip to the gym. Even walking around while talking on the phone is counted as activity – taking the stairs and not the lift is exercise and can contribute to your 30-minute daily exercise. Parking your car as far from the shopping center’s entrance is also counted as activity. The national study of more than 6,000 American adults shows that an active lifestyle approach, as opposed to structured exercise, may be just as beneficial in improving health outcomes, including preventing metabolic syndrome, high blood pressure, and high cholesterol. People who spend hours each day without getting up and moving around should take heed: A new study suggests that the more people sit each day, the greater their risk for chronic health problems, such as cancer, diabetes and heart disease. Researchers from Australia and Kansas State University said their findings have implications for office workers, truck drivers and other people who regularly sit for long periods of time. To reduce the risk of chronic disease, the study authors concluded that people should sit less, and move more. “We know that with very high confidence that more physically active people do better with regard to chronic disease compared with less physically active people, but we should also be looking at reducing sitting,” Richard Rosenkranz, assistant professor of human nutrition at Kansas State University, said in a university news release. “A lot of office jobs that require long periods of sitting may be hazardous to your health because of inactivity and the low levels of energy expenditure,” he explained. The study revealed that the men who sat for four hours or less daily were much less likely to have a chronic condition — such as cancer, diabetes, heart disease or high blood pressure — than those who sat for more than four hours each day. And the men who sat for at least six hours daily were at significantly greater risk for diabetes, the researchers noted. The number of chronic diseases reported increased along with sitting time. This was true even after the investigators took the men’s physical activity level, age, income, education, weight and height into account. “We saw a steady stair-step increase in risk of chronic diseases the more participants sat. The group sitting more than eight hours clearly had the highest risk,” said Rosenkranz. Of course, these deadly patterns reflect health issues beyond cancer – conditions such as heart and respiratory disease and diabetes, to name a few. Even so, the link between physical activity and cancer prevention has been confirmed through decades of research. What to do if you have a “desk job” – or drive for several hours at a stretch every day? Here are helpful suggestions from our experts for adding bursts of activity to your daily routine. Exercise at lunch with colleagues or friends by taking a brisk walk. Visit co-workers in person instead of e-mailing. Walk or bike when doing personal errands. Stand up and stretch as many muscles as possible and even lift hand weights. When driving, stop every two hours for a walk, stretch or mini-workout. Dry yourself vigorously after taking a shower. I bought a Re-Bounder and use it twice a day for a few minutes – really good exercise. But What Did “They” Leave Out in My Opinion? New findings are now saying that something almost everyone does every day increases the risk of getting cancer. When does it end, right? When a study comes out and gets media attention, most people take it at face value. But a deeper look into this issue reveals a different picture and helps you to understand the why behind this “new” risk factor. That’s why you always need to look at the cause, or the “why” behind the reason that cancer (or any disease for that matter) occurs. This is something conventional medicine has no interest in because the why isn’t all that profitable. Treating symptoms, on the other hand, is extremely lucrative. Just look at the exorbitant costs associated with surgery, radiation, and chemotherapy and other drugs. Yet none of these approaches will ever get to the root cause as to why someone got cancer in the first place! And curing a disease isn’t nearly as profitable as expensive surgery or treating someone with high-priced drugs for a long time – often an entire lifetime. Is it True that just Sitting causes cancer and other diseases? New studies have concluded that sitting for too long does increase your risk of cancer and that inactivity is even more dangerous for women. Over the last five years, there have been a handful of studies making major headlines about the unhealthy practice of inactivity. In fact, many doctors and scientists are calling sitting the new smoking due to the multiple health risks associated with both. The data seems to be clear no matter what angle you look at it. Sitting does not prevent cancer, it most likely increases your chances of getting it. However, there are many important factors that all these studies have left out. Most people living in the modern world are exposed to electromagnetic radiation(EMF) to some degree. EMF has already been proven to be a possible carcinogen. EMF exposure to the human body is highly dependent upon proximity and duration. If a sedentary individual also has their body in close proximity to a computer, tablet, cell phone, or television there will likely be an increased cancer risk. Many of the studies referenced in this article have collected data spanning over two decades. During that time, there has been a steady increase in the toxicity of our environment, personal care products, and food supply. Known cancer-causing pollutants such as glyphosate, GMO foods, heavy metals, radiation, sugar and other chemicals are now prevalent and must be avoided. 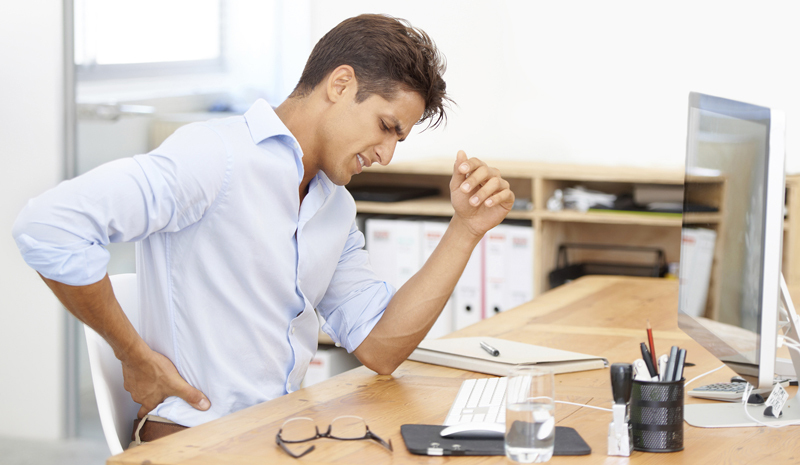 Could This Rather Be the Real Reason Why Sitting is So Bad for You? The other probable link between a sedentary lifestyle and an increased cancer risk is the movement of the lymphatic system (or lack thereof), which acts as a filtration system and is a key part of your immune system. Unlike the circulatory system, the lymphatic system has no pump of its own to circulate lymphatic fluid. Movement and contraction of the muscles is the engine that moves lymph fluid. This is why it is so important to be physically active and begin daily habits of activity. The immune system is the key preventative system to all diseases including cancer so keep it balanced, intelligent and strong at all times. Massage, skin brushing, far-infrared saunas, and rebounding are all safe options to increase the movement of the lymphatic system which has far reaching benefits beyond just cancer prevention. On top of that, it is vitally important to eliminate environmental toxins from your life and diet to change biomarkers of cancer and most other dreaded disease risks. Finally, there is a correlation between the amount of time sitting and increased risk of developing chronic diseases. This increases even more if we sit with EMF around us. This again increases even more if we eat incorrectly. This increases enormously if we cannot control our negative stress & emotions like anger or self-pity. Become aware. Start changing habits to-day. Take that first step.